The art career of Mike Slobot is like a good story; and, as is true of any good story, one must start at its beginning. “I started making art in [the] third grade or so”, recalls Slobot, who “kept making art through high school.” Believing at the time that he would “go to art school”, he admits that he ultimately “ended up getting a communications degree and a graphic design degree in college, but kept making art”. When “I first started putting my art online in the [early] 2000s”, Slobot continues, “I picked [the alias] m.heisler”, which he explains was “a nod to one of my grandparents”. But his current direction wasn’t undertaken until 2004, when he “was trying to come up with something to paint and my wife said, ‘Paint me a robot’. I did, and it kind of snowballed from there”, he says with an implied smirk. “Pretty soon, there were robots everywhere”. Envisioning these creations as “first or second generation robots from the future that are already outdated, so they are looking for jobs or meaning in life after being replaced by newer, flashier models”, the artist collectively refers to these as Slobots, “a combination of ‘Slow’ and ‘Robot'”, which “is a reflection of how I see the Slobots“. Adding that when he “first started making them, I started looking at all kinds of robots”, noting that he was “especially drawn to the tin robots like Schylling makes and that whole space-age idea of a robotic friend”. Realizing what he wished to convey through his art, Slobot states that he “wanted my robots to feel more human”, adding how they should be viewed as “friendly and not destructive, like the ultimate robot friend”. And while he freely admits that his wife was “definitely the genesis of the Slobots“, due to her simple request for a robot painting, but the origin of his more commonly known alias stems from when “one of the blogs or sites called me Mike Slobot instead of m.heisler and it stuck. It’s become what everyone knows me as”, Slobot concedes, “and I found that I like it”. In contrast to the “superrealism” works of Hajime Sorayama, Slobot prefers to embrace a retro aesthetic for his robotic creations. Structurally reminiscent of the Bauhaus movement, Slobot’s works stitch together craftsmanship and fine art to form an elegant combination of geometric shapes and organically fluid parts. And, arguably, the ultimate examples of this appearance are Slobot’s sculptural works, which frequently are heavily modified designer toy forms. Initially inspired by “an article in this magazine called ReadyMade about Paul Budnitz“, the founder of Kidrobot, Slobot admits that reading this interview “opened my eyes to a world I didn’t know about”, the world of art toys. While “I was already making my Slobots out of polymer clay and stuff I found around the house”, the artist reveals, it was 2005’s Trexi Doodle Contest from Play Imaginative that first had him modifying an existing art toy form. “It was a set of two Trexis with their heads on backwards”, as Slobot describes his entry, and “I made up this story that they were gas station robots in space on Venus or Pluto or something”. By the end of that year, Slobot’s art toy work began receiving recognition, his Slomunny Seeker & Friend entry into Überbot‘s Munny Show awarded the “Best in Show” designation. Following this, he was invited to participate in Toy2R‘s DIY Bart Qee World Tour, a traveling exhibition throughout 2007 of Bart Simpson interpretations. “Those two shows”, the artist admits, “were probably the start of what has become the Slobots“. In the fourteen years since their humble beginnings, Slobots have been exhibited to a worldwide audience, featured in gallery displays from New York City to Tokyo to Los Angeles. “My last few shows have been in more traditional art settings”, Slobot discloses, a trend set to continue with his newest exhibition, I Love My Robot, which “is happening in the Louise Jones Brown Gallery at Duke University“. With the gallery “set up in two spaces with curved corners” and “a walkway between them”, as Slobot describes it, he can’t help but comment that it “feels kind of futuristic to me, like a spaceship or something”. A seemingly perfect setting for his robot-centric works, Slobot states that “I anticipate [having] between 25-30 pieces for the show”, encompassing “a mix of sculptures and paintings” that he has been devotedly creating in his studio. While a visitor to Slobot’s studio may mistake it as being filled with seemingly chaotic arrays of items, which he describes as “my bins full of stuff”, this is due to the artist’s slightly unorthodox creation process. “At heart, I lean towards assemblage when I work”, he explains, “I build and paint all the pieces and then figure out how to assemble them”. Though not averse to beginning with a concept sketch, Slobot tends to “build as I go, swapping pieces out and making changes so that the way the piece started is often not what it looks like when I finish”, he confesses. “I usually get inspired by a single piece”, Slobot divulges, “and then the rest of the sculpture gets built around that initial piece”. For instance, using “a big, oblong acrylic box that I found at a thrift store” as a base, the artist describes how it “had different feet and shoulders when I started”, adding how the box itself was initially painted by him in “a light blue, then a kind of an army green, and right now [it] is kind of an electric, acid green”. “I realize that the idea of robot friend is at once immanent and also a little scary”, Slobot states, “from the standpoint of having a walking computer following you around that could record everything you do and say”. Perhaps a commentary evolving from that realization, another of the works Slobot is constructing for this exhibition “is an 8-inch [tall] Lego minifig [that] I got at a flea market”, it’s head replaced by “a dummy security camera”, the artist explains. In what is perhaps a more subtle statement regarding the intrusion by technology into our daily lives, “I have been working on some multimedia pieces”, Slobot announces, “that will be a little bit of tech, sculpture, and painting all at once”. One example of this will “use a 10-inch tablet [computer] as the body and then have wood shapes as the arms and legs of the bot”, the artist reveals. But regardless of how the Slobots manifest, the story of them and their creator seems far from over. 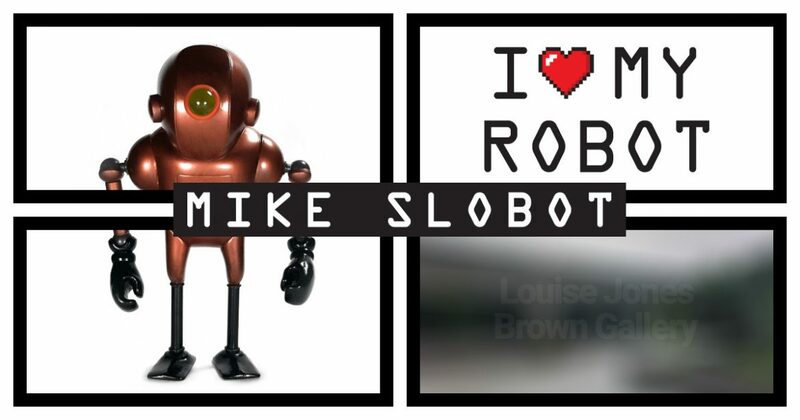 Mike Slobot’s I Love My Robot solo exhibition at Louise Jones Brown Gallery will have its opening reception on Thursday, November 15th from 7-9pm. All works in this exhibition will remain on display until December 2nd, 2018 at the gallery’s physical location (036 Bryan Center – Plaza Level, 125 Science Dr, Durham, NC 27710).